The town of Mirecourt is situated on the banks of the picturesque River Madon in the Lorraine, Vosges area of North East France. 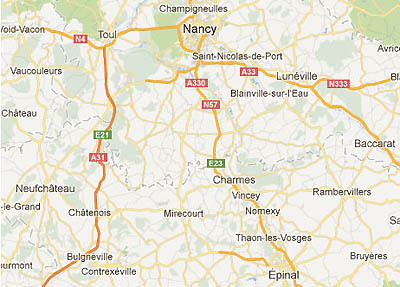 It is not far from the French borders with Luxembourg, Switzerland and Germany and has good road and rail links to the major towns of Nancy and Epinal. Mirecourt is the administrative capital of a canton positioned in the Xantois district at the heart of the Vosges plain. Mirecourt is situated on the important Roman way linking Langres and Strasbourg and, for this reason, it has been suggested that the name of the town is derived from the winged Roman God, Mercury (Mercure in French). However there is no evidence for this – despite Wikipedia’s assertion. In 960 AD, we find the first reference to the name Mirecourt and it seems more likely that it is so named because it came within an area owned by Muricus which passed at that point into the ownership of the Abbey. 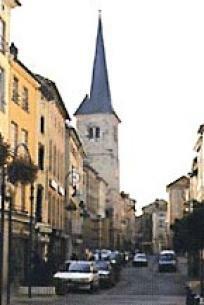 In 1284 it was annexed to the Duchy of Lorraine. Whatever the origin, from early days Mirecourt was a busy trading centre and was particularly known for the skilled work of its tanners, drapers and armourers. 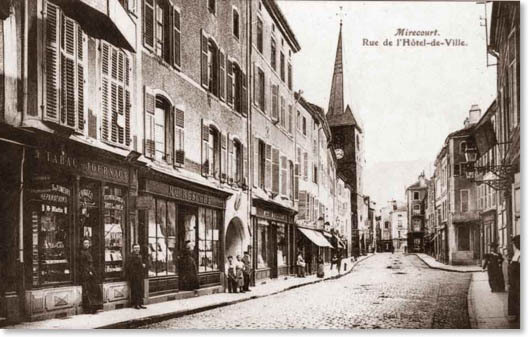 Mirecourt came into its violin making heyday from the beginning of the 19th Century. 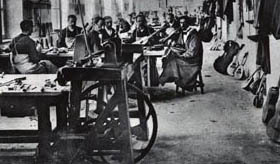 Didier NICOLAS, already an established maker, developed a large manufacturing base which needed many apprentices and pupils to meet the steady demand for violins. His well-known triangular trademark was later bought by DERAZEY and subsequently by LABERTE MAGNIÉ. As the 19th century progressed and turned into the 20th, more and more ateliers (workshops) were established in Mirecourt, usually run as family workshops by names that have become internationally famous nowadays. APPARUT, BAZIN, BERNADEL, BUTHOD, CHAPPUY, CLASQUIN, COLLIN-MEZIN, DIEUDONNÉ, OUCHARD, PECCATTE are just a tiny part of the list of Mirecourt violin and bow makers which is simply stunning in its scope. Tracing exactly who made a violin or bow becomes more complicated as the various Mirecourt families intermarried: Louis KAUL married Jeanne BAZIN, a LABERTE son and daughter married a DIDION and FOURNIER, a CUNIOT married a HURY, a JAQUOT married an AUBRY etc etc. Often labels and marks were used by successive generations within a family and sometimes sold to a different house who continued to use it. By 1925 the craft was organised into 18 workshops and 4 factories employing nearly 700 workers, most of whom were very skilled craftsmen. There were also some women makers, although much fewer in number. Probably the largest of these so-called factories was Jerome THIBOUVILLE-LAMY, or J.T.L. but they coexisted well with the smaller family ateliers. Sadly these great names fell into decline, especially with the impact of the second world war where so many young men were lost and materials were difficult to obtain. In the 1960s and 1970s, however, efforts were made to rediscover Mirecourt’s glorious heritage. 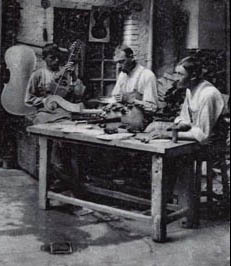 Modern day Mirecourt, remarkably, still maintains its links with its historic industry of instrument -making and the logo on the Office de Tourisme de Mirecourt declares it is the Capitale de la Lutherie. Indeed the National School of Lutherie was established there some forty years ago under the inspiration of Etienne VATELOT and is now based, charmingly, at the school which is named after Jean-Baptiste VUILLAUME.